Venus Love and Beauty Shock! 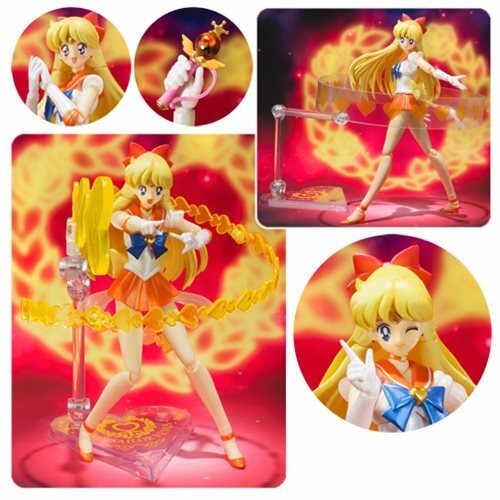 Sailor Venus, leader of the Sailor Soldiers in Sailor Moon SuperS, joins the SH Figuarts line! Just as with the other figures in the series, she includes effect parts for her own attack technique. The Sailor Moon SuperS Super Sailor Venus SH Figuarts Action Figure includes 4x expression parts, 5x pairs of optional hands, Crystal Change Rod, 2x Venus Love and Beauty Shock effects, a stand with 2 supports, and 2 effect clips. Measures about 5 7/10-inches tall. Ages 15 and up.